LETHBRIDGE, Alta. – Kevin Koe and Team Canada jumped on winless Norway (0-4) for five in the third end and had Magnus Ramsfjell and his teammates shaking hands after six ends in a decisive 10-2 win that kept Canada (5-0) unbeaten at the 2019 Pioneer Hi-Bred World Men’s Curling Championship, presented by Service Experts Heating, Air Conditioning and Plumbing. LETHBRIDGE, Alta. – Yuta Matsumura and Team Japan survived an early scare from the Netherlands to score a 9-7, extra-end victory that kept them unbeaten at 4-0 Monday at the 2019 Pioneer Hi-Bred World Men’s Curling Championship, presented by Service Experts Heating, Air Conditioning and Plumbing. LETHBRIDGE, Alta. 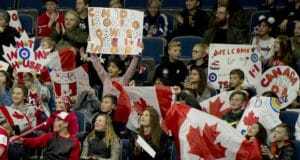 – Kevin Koe and Team Canada struggled once again Sunday evening but made enough shots to subdue Qiang Zou of China 8-6 to remain unbeaten at 4-0 at the 2019 Pioneer Hi-Bred World Men’s Curling Championship, presented by Service Experts Heating, Air Conditioning and Plumbing. LETHBRIDGE, Alta. – Kevin Koe and Team Canada showed a ton of patience and confidence in their game through some early struggles Sunday afternoon and it paid off handsomely with a 9-5 win over Joel Retornaz of Italy at the 2019 Pioneer Hi-Bred World Men’s Curling Championship, presented by Service Experts Heating, Air Conditioning and Plumbing. LETHBRIDGE, Alta. – Jet lag? Seven-week layoff? Neither has bothered defending champion Niklas Edin and his powerhouse Swedish team in the early goings of the 2019 Pioneer Hi-Bred World Men’s Curling Championship, presented by Service Experts Heating, Air Conditioning and Plumbing.